Hi there! 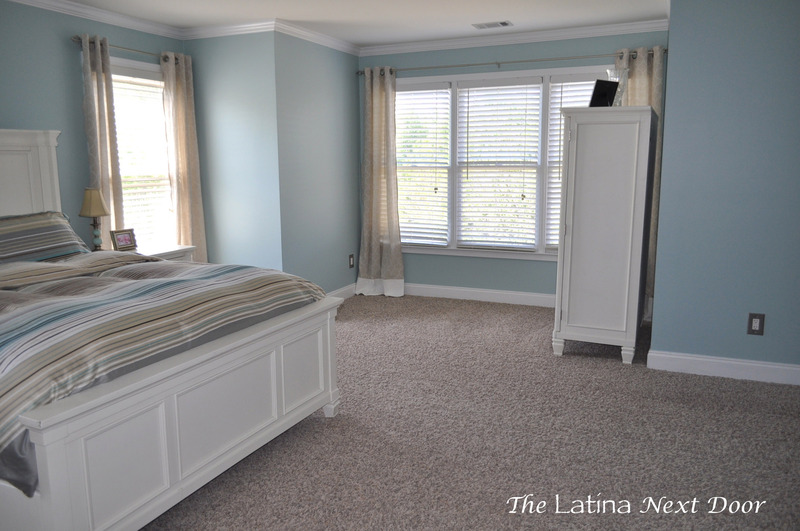 As promised, here is where we are at with the master bedroom. 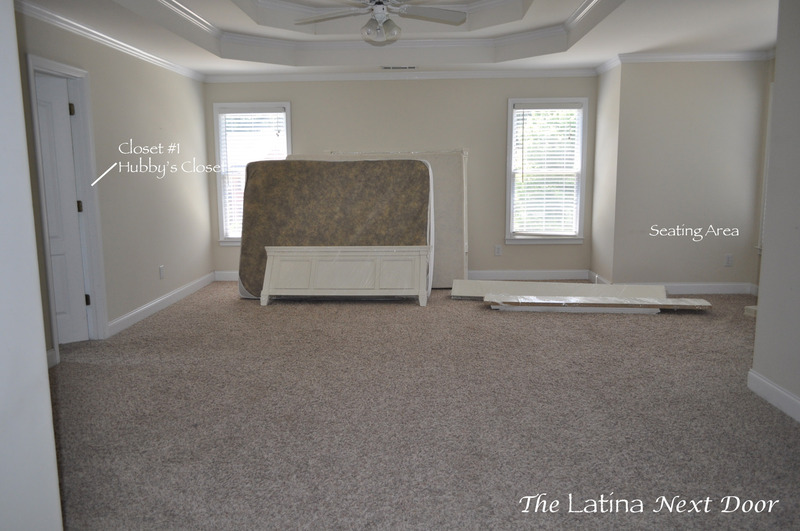 The furniture is completely assembled (more on that later), the walls are painted, the curtains are up and the room has been de-cluttered. I would like to get a nicer bedspread, but the duvet set above from Ikea will do just fine for now. I have several and I change them throughout the year anyways, but I would like to have a really nice one, maybe something I can customize… still brainstorming on that one. Above you can see the scale of the room. I have labeled a few areas that need work still. I have a really cool idea for the artwork above the bed (we will see how that turns out). Below is that cute little sitting area, where there is absolutely no sitting going on at this time. I just love how the blue walls turned out. Not too light, not too dark, but just right (there, I had my Goldie Locks moment). Next, you can see the media console area. I want to eventually remove the kids’ hamper and put a small console table there. 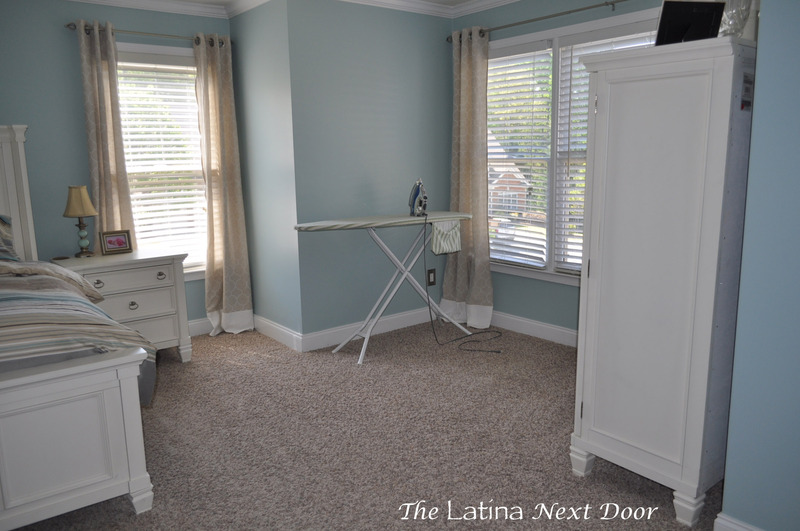 I think I want the table to be the same color of that hamper or maybe a silver-gray color. It would give the room a nice contrast from all the white furniture. I already have the decorative mirror I want to install which I will show you in a minute. I just have to talk the hubby into doing it for me. And those cursed furniture legs!!!!! Yeah, that is why I have had to wait so long to post this even though it has been a couple of months since we painted. We couldn’t find the screws to install those legs anywhere! We ended up finding them under my hubby’s bathroom sink in a plastic bag. Still wondering how those got there. We just finished putting them on this week. Then, we have that beautiful trey ceiling which was the most neck breaking job ever!!! So glad I am done with that, more importantly, I am glad the paint worked out, cause I don’t want to paint that again for a long, long time. I am happy with the way it came out though. Stunning, if I don’t say so myself. Below is a close-up of my night stand. I would like to eventually buy larger more luxurious lamps, but for now these do the job. Everything is so large in our room. It will take me a bit to bring everything to scale. Like how I “hide” my phone charger? I am lucky there is a small gap under the stand that allows me to do this. 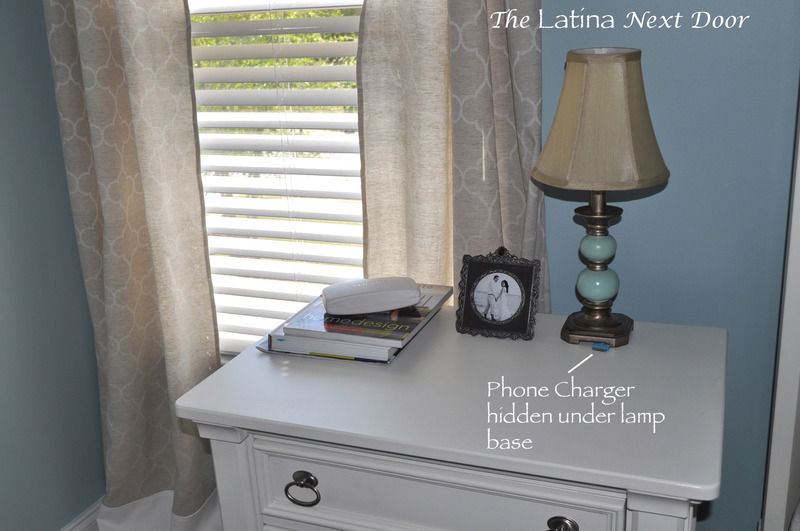 It is a great way to hide that cord! And true to fashion, here you have my bedside reading material. 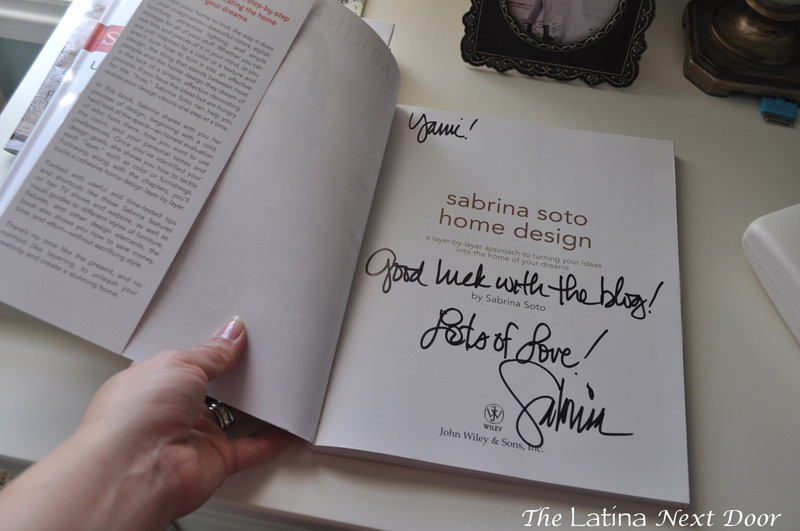 That Home Design is actually autographed by Sabrina herself…. I am such a fan. You can read about how I met her here. 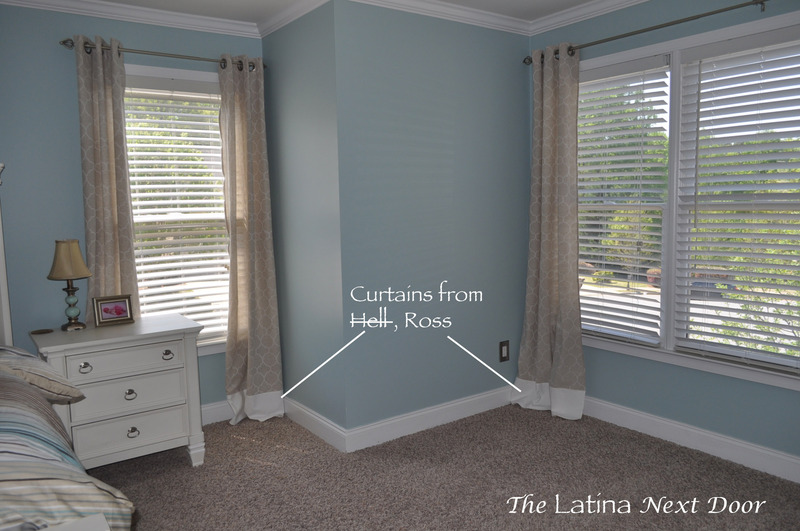 Then, below are those lovely curtains from hell Ross. You see that nice white detail on the bottom? That did NOT come with the curtains. It was necessary due to the fact that they were too short…. it MUST have been why they were so cheap! It’s a good thing my mother-in-law has already taught me a few things on the sewing machine. I will post detailed instructions on how I did them, in case any of you ever come across this. It is a good thing it happened though. I kinda like them with that detail. 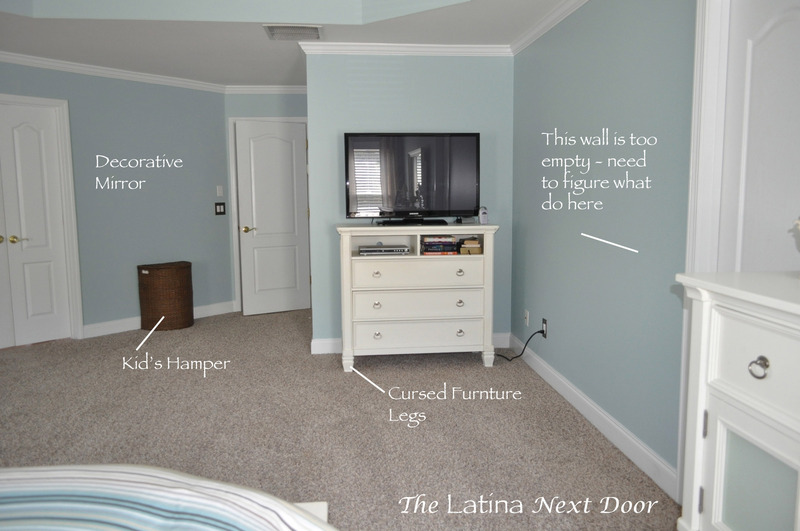 It’s almost like I was trying to mimic the tall baseboards. Plus, it makes them unique and I can say I did them. Can ya gimme a better silver lining than that? 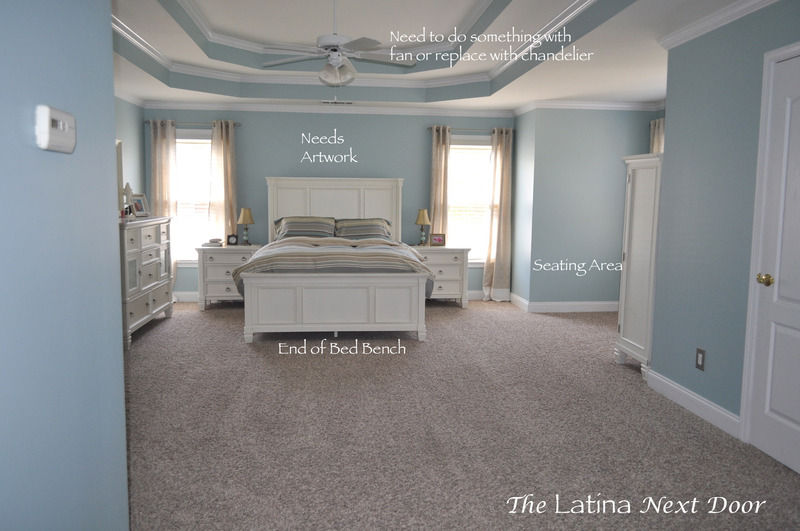 And in case the thought even dared to cross your mind, no my room is not always this neat. Here is what the seating area looks like on a daily basis. The ironing board has permanent residency here, until I complete my reading nook. 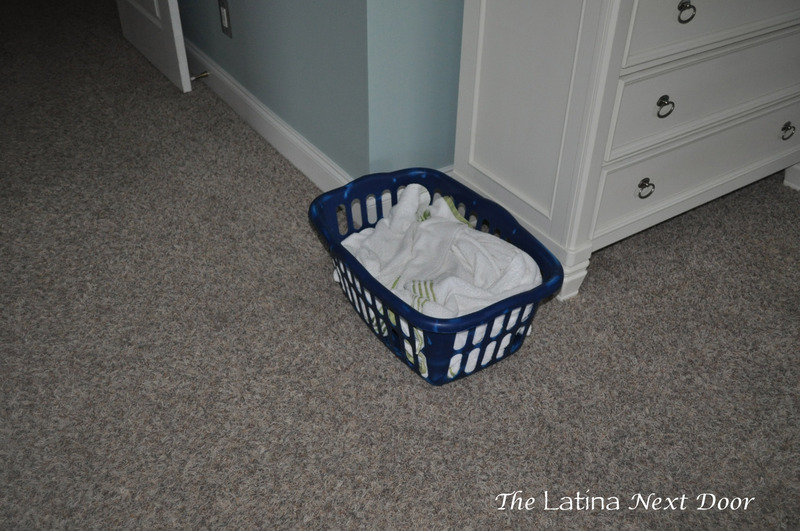 There is usually a laundry basket filled with my next load sitting beside the TV console. I take it downstairs first thing in the morning when I get up (I really shouldn’t be airing my dirty laundry online, I should be ashamed!). 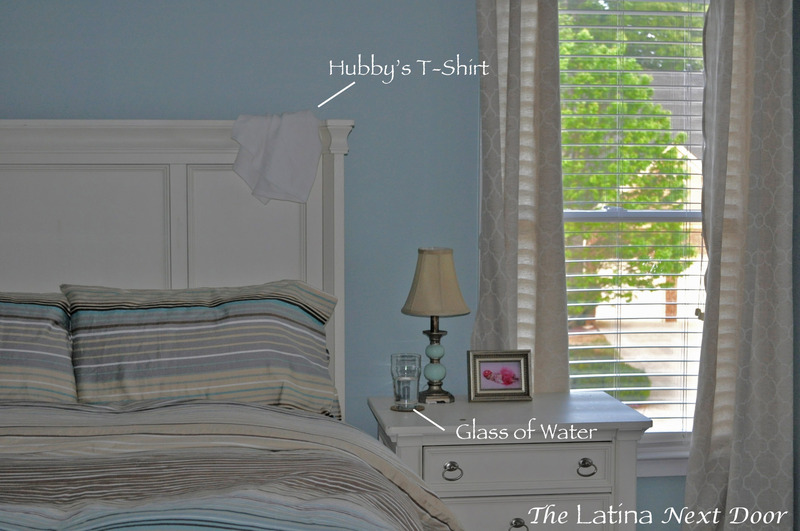 And lastly, there is always the t-shirt the hubby wore to bed the night before hanging over the head board. And you will always find several glasses of water on the night stands and dressers. We are like that family in the movie Signs. If aliens who are allergic to water ever invade Earth, we’ll be ready. 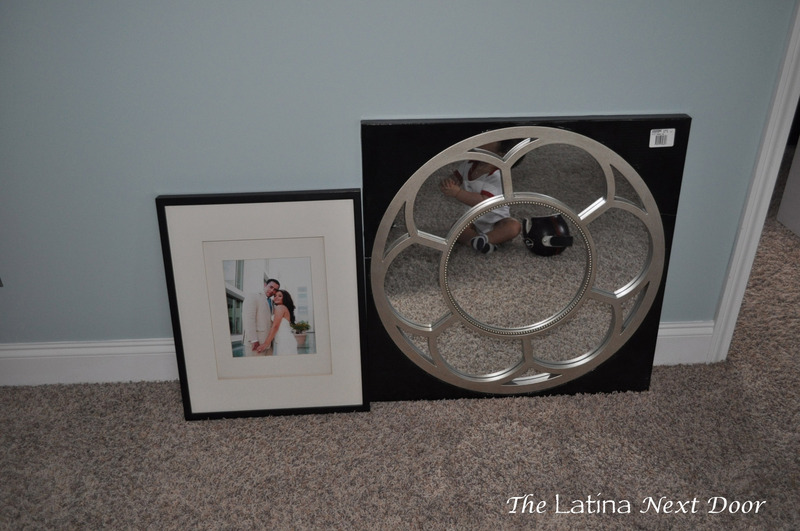 And lastly, here is that mirror I still need to hang above the kids’ hamper and one of my favorite wedding pictures. The frame will need to be painted to better suit the color scheme of the room, but I’m in no rush. At least my room feels like somewhat of a sanctuary, which is what I wanted. Can you see my little guy photo bombing the picture??? Oh, and in case you forgot what the space looked like when we moved in, here is a pic to refresh that memory! Let me know if you have any comments or suggestions! I would love to get your feedback. Have a great weekend everyone. It will be in the 80’s! Thank you so much Ivory! I am appreciate your feedback! 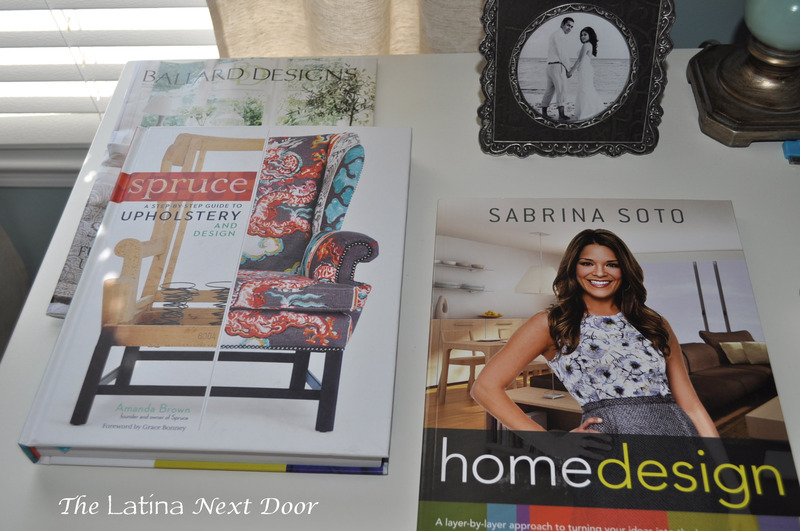 What a gorgeous makeover to your home! You are an inspiration. Thank you. 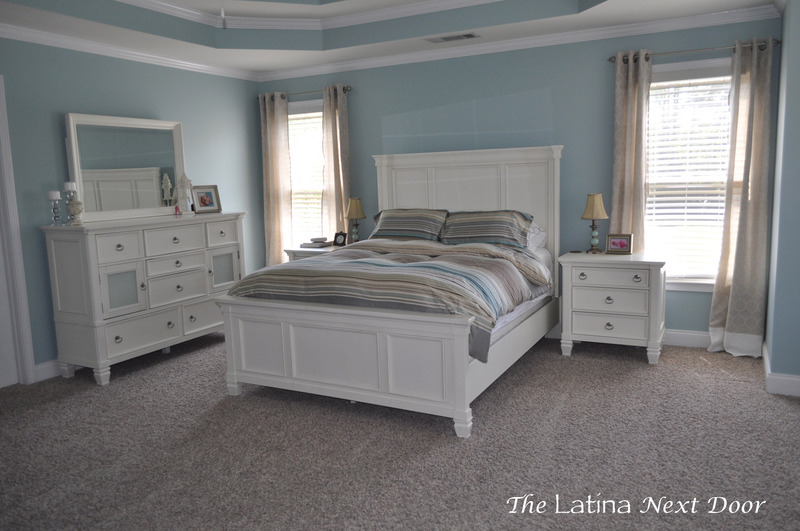 I chose Gossamer Blue, Benjamin Moore for my bedroom makeover. Thank you for your posts. 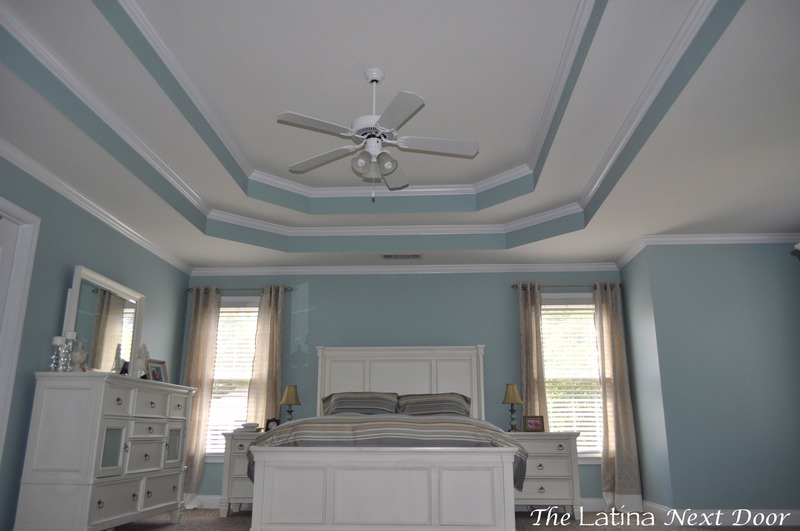 Pamela, you are going love that blue color on your walls!